See Shop Floor Automations’ recent advertisement here in Modern Machine Shop September 2014 issue below. 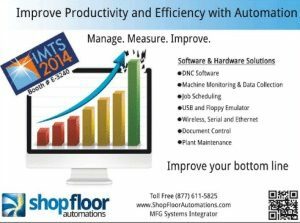 Shop Floor Automations can help improve your bottom line! We provide the best software, hardware and installation services since 1998! Our solutions include DNC software, machine monitoring, data collection, updating floppy drives to USB, helping companies monitor data wireless, and many more specialties. If you want to update your machine shop without buying new machines, call us! SFA is located across the social media landscape. You can like us on Facebook, follow us on Twitter, connect on LinkedIn, subscribe to our YouTube channel, and so much more. Check out our social media resources page by clicking here. You may also read our blog by clicking here.